I wanted to include West Dean Gardens in this series because of a contrast between the timelessness of the place and the age of its fruit trees. When I visited West Dean on 24 June 2018, it felt as if its walled productive garden had always been there and would be there forever. At the same time, the trees were less than thirty years old. It is only when I researched the history of West Dean and the Edwards James Foundation that I discovered the amazing restoration that had started here in the early nineties. It enabled me to understand why the walled garden’s trees are rather young, and to make better sense of what timelessness means when it comes to orchards. ‘West Dean Gardens in West Sussex is one of the greatest restored gardens open to the public in England’1. 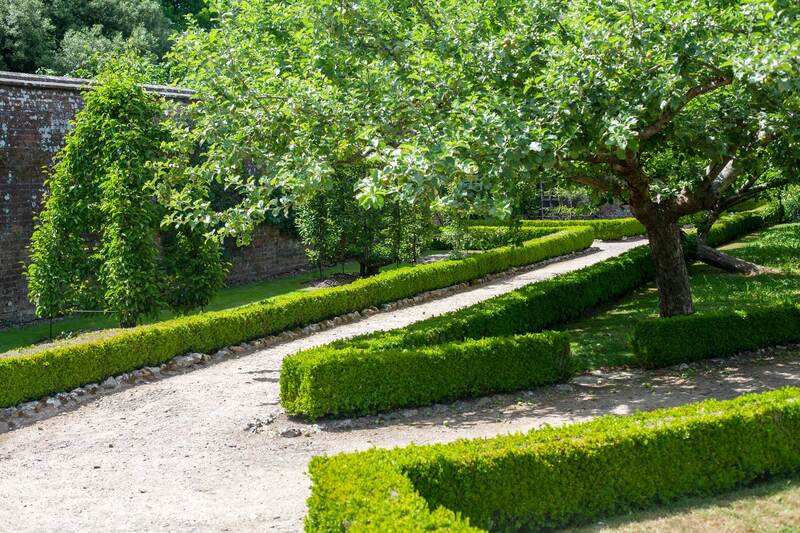 I found it a place of great tranquility, in particular the part I was most interested in, the Victorian Walled Kitchen Garden and its fruit trees created at the beginning of the nineteenth century2. 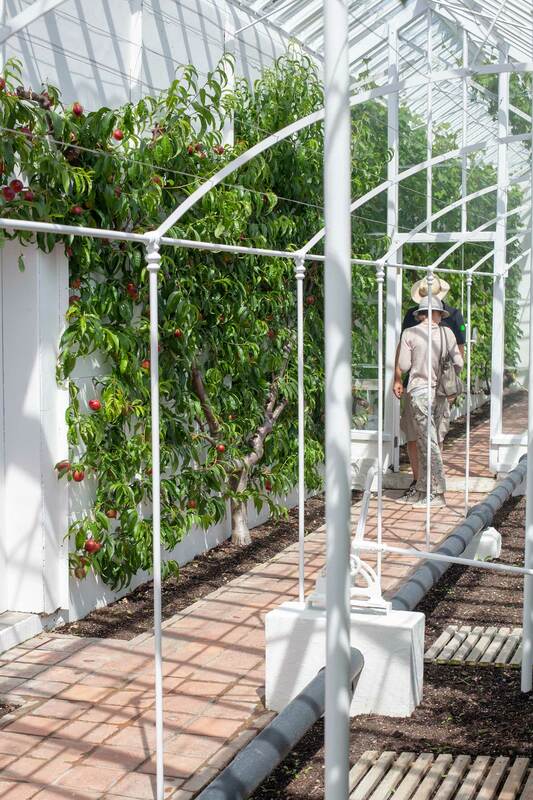 Fruit trees can be found in the three sections of the Victorian Walled Kitchen Garden defined in West Dean’s visitor map3: the Walled Fruit Garden, the Victorian Glasshouses and the Kitchen Gardens. 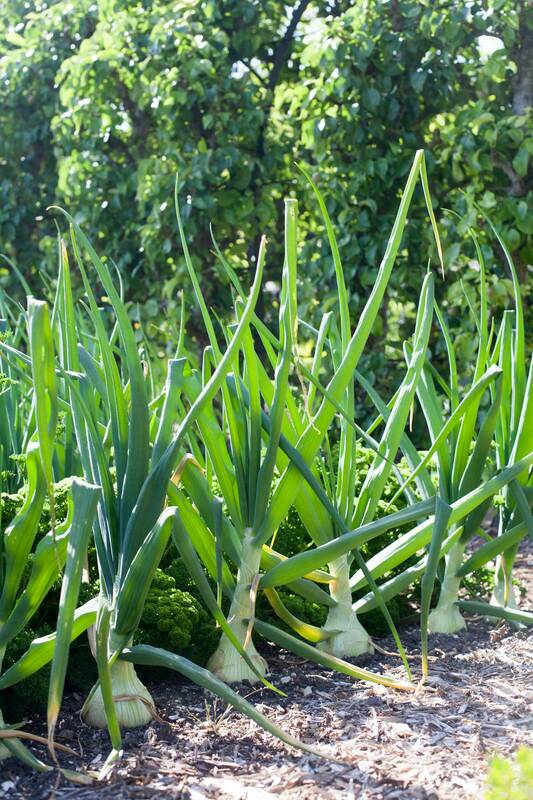 In this article, I will consider the Victorian Walled Kitchen Garden as a single entity called ‘the walled garden’. 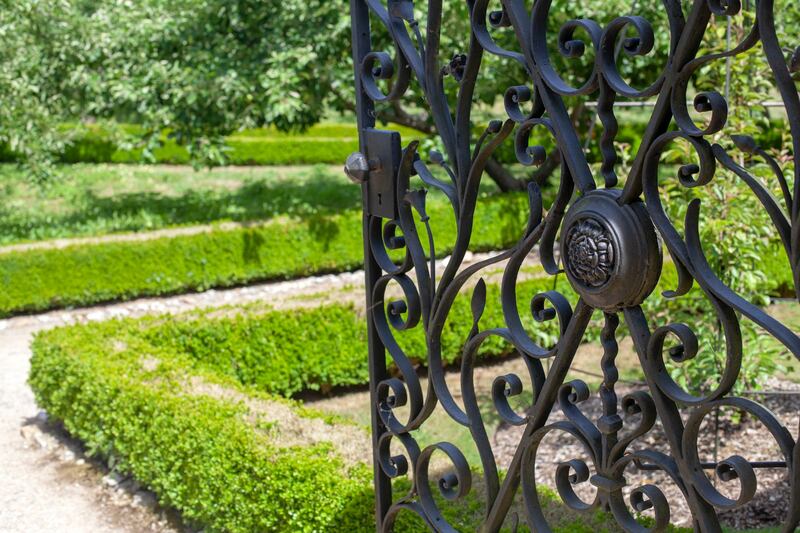 Solid brick walls, an intricate wrought iron gate, a white alley bordered with a low hedge of sharp green boxwood, and a vigorous apple tree: this was an inviting first sight of the walled garden. Photo 24 June 2018, West Dean Gardens, West Sussex, United Kingdom. There was a lot of fruit inside the walled garden. The gardeners had started thinning the apples, taking excess fruit off the trees. Clematis and thistle are just two examples of the diversity of plants growing in the forest garden. 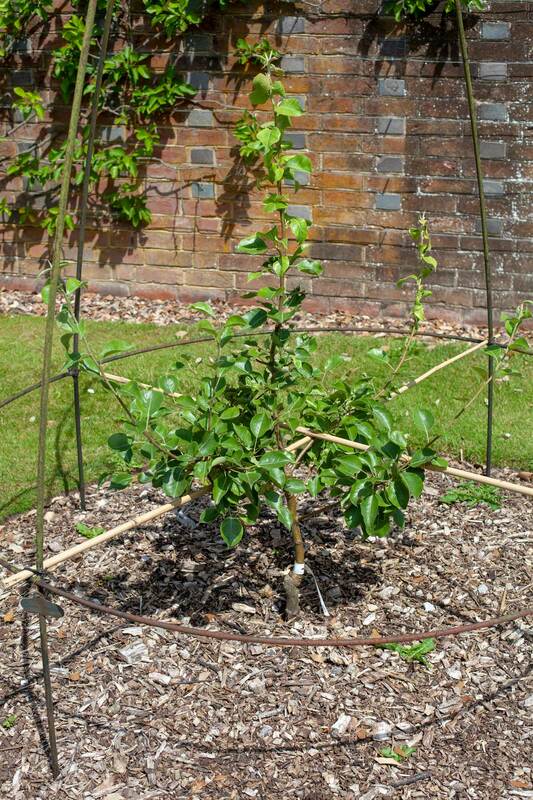 … As well as vegetables, growing here next to a pergola of pear trees. West Dean is famous for its trained trees. We can see some of them in the background, behind these vines which grow in one of the six glasshouses dedicated to fruit. What I find most remarkable at West Dean is the attention to detail in every aspect of the design and its impeccable execution. I could have chosen pictures of the diversity of soft fruit available at West Dean in June. However, I thought these nectarines, which require more care, would tell more about the amount of work carried out to make this place look so heavenly. This garden full of life filled me with a sense of timelessness. According to Dictionary.com, timeless means ‘without beginning or end; eternal; everlasting’ and ‘referring or restricted to no particular time’4. To me, timelessness has also something to do with wonder. Timelessness characterises the wonders of life, life that brings contentment to living beings while endlessly perpetuating itself. I found the walled garden wondrous. Why did I feel such contentment? A book about the restoration of West Dean Gardens after the Great Storm of 1987 helped me figure it out. Jim Buckland and wife Sarah Wain, head gardeners here from 1991 to 2019, wrote ‘At West Dean – The creation of an exemplary garden’ (Buckland & Wain, 2018). The book, a passionate account of their gardening experience here, provided me with insights into their vision of what a successful garden is and what they achieved at West Dean. In their introduction of the Fruit Garden chapter, they discuss ‘Andrew Marvell’s poetic meditation on the superiority of a contemplative life lived close to Edenic nature’ and describe the fruit garden as ‘a supreme expression of a life well-lived’ (2018: 245). Plants live their lives well here. 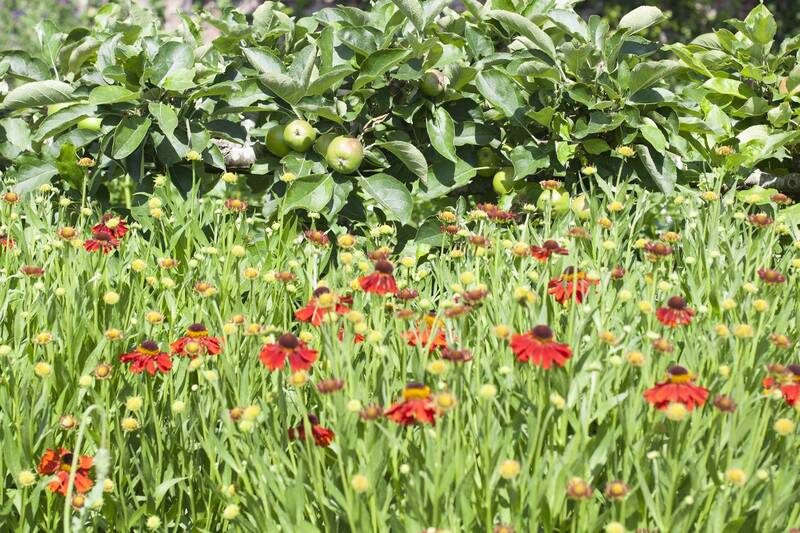 The fruit trees and the other plants inside the walled garden form a diverse and thrivingly productive ecosystem. I hope my photographs reflect this. As for me, who strolled through the garden on such a wonderful day, I felt in harmony with the place, part of the good life. I was receptive to this wonder, and my presence was somewhat adding to it, not only through my financial contribution as a visitor but also through my own enjoyment of this ‘Edenic nature’. Jim Buckland, Sarah Wain and their team of gardeners are not in my pictures. However, during my visit it was as if they were present, so striking was the evidence of the amount of highly skilled work carried out to create and maintain this ‘exemplary garden’. 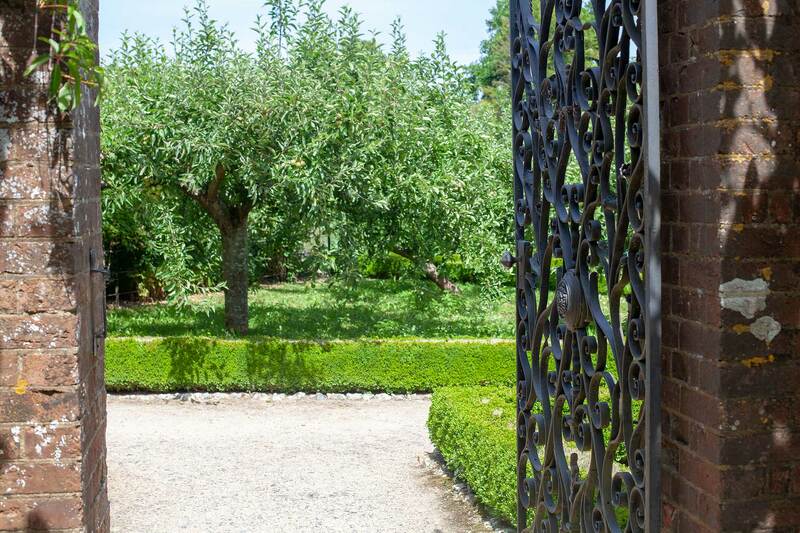 The wonders of the orchard are their achievement, reached through twenty-seven years of continuous custodianship since the beginning of the restoration, carried out under the patronage of the Edwards James Foundation. Are visitors aware of this sustained commitment? I would say that conscious or not of the amount of energy, time and resources expanded, they see its outcome when they walk in the walled garden. I am probably not the only one who felt ‘that subtle sense of “rightness” that makes it impossible to imagine a place that could be different of what it actually is’, Buckland & Wain’s definition of a successful garden (2018: 21). This quote perfectly defines timelessness at West Dean. The walled garden at West Dean: a timeless Eden open to public enjoyment. Would this feeling of timelessness be as strong if the walled garden was not part of a bigger place? This small enclosure in the 2,400 hectares of the Edward James Foundation Estate has benefited not only from decades of the order and stability that made the restoration of its gardens possible, but from the centuries-long evolution of the estate. The core of the main building of the West Dean Estate was built in 1738. The records of the presence of a manor dates back to 10865. The 19th century walled garden, where the fruit collection is located. This wall reminds me of the great parks in South West London. I remember for instance the long brick walls enclosing Home Park around Hampton Court Palace6, Bushy Park, Richmond Park and the Royal Botanic Gardens at Kew. The walled garden orchard felt timeless to me because West Dean Gardens resembles the parks and gardens taken care of by the powerful conservation bodies which manage large heritage estates in the UK. Advertisement inside the walled productive garden. I had mixed feelings about this advertising board: marketing was somewhat invading a sacred garden. 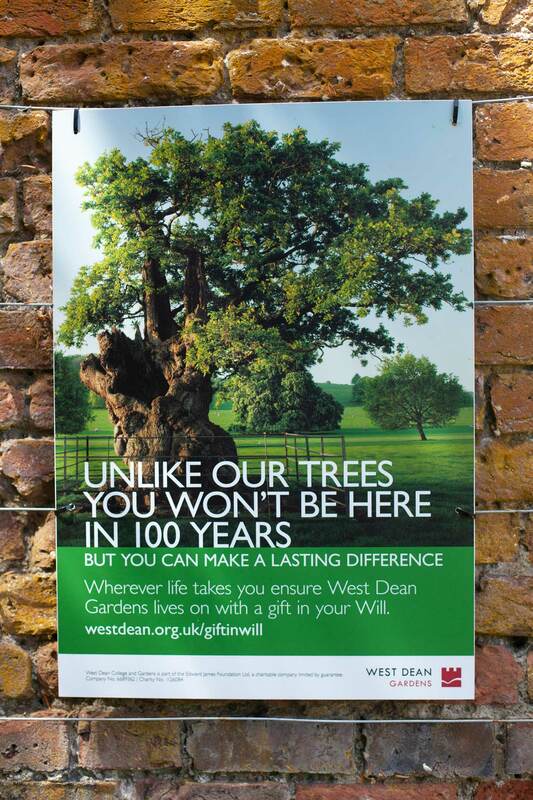 Having said that, I guess it reinforces the abiding character of West Dean Gardens and attracts donators. In any case, overall, the timelessness of West Dean’s walled productive garden is not only due to the way the place is being cared for by its gardeners, but also to the long tradition of British heritage conservation. 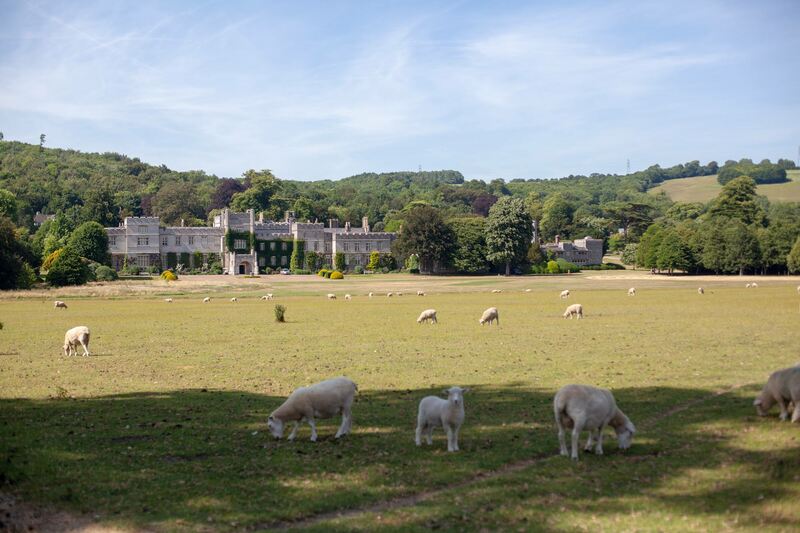 The presence of West Dean College on the site, an education institution created by the Edwards James Foundation in 1971 and ‘internationally recognised for excellence in conservation and arts education’7, reinforces this. The multi-centenary oak tree contrasts with the shorter life expectancy of fruit trees. 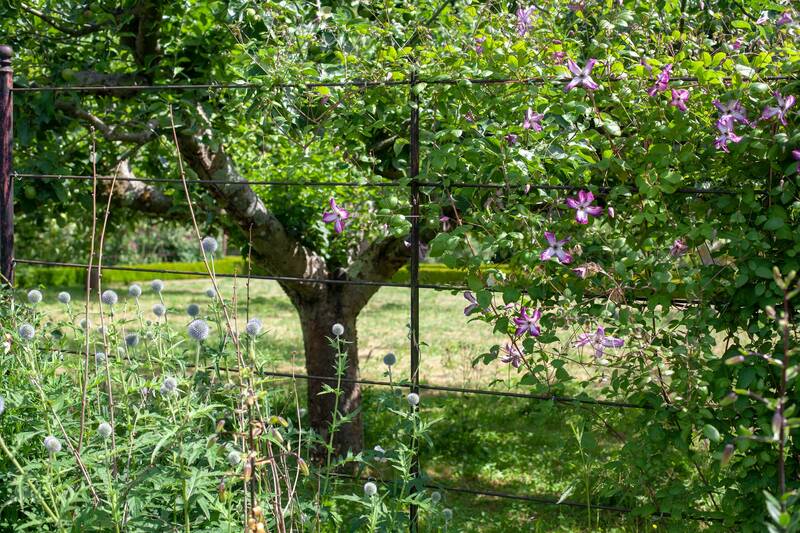 West Dean’s walled garden may be a timeless orchard. However, none of its fruit trees are centenary, very far from that. In fact, they are younger than many of the garden’s visitors: ‘the bulk of the walled garden fruit was planted in the mid-nineties’8, which means the trees are still in their twenties. Mature and younger trees in the walled garden. The most mature are less than thirty years old. Pear tree at early formation stage. The trees are replaced when needed. For instance, the only trees which dated back to the walled garden’s hey-days, at the turn of the twentieth century, two fig trees, were recently removed. ‘Over the last two decades they had declined, and when their respective houses were recently renovated we took the opportunity to remove them and replace them with vigorous new plants, thus starting the cycle again for the next century.’ (2018: 153). This is one of the reasons why there are no old fruit trees in the walled garden: this is a place where plant vigour comes first. 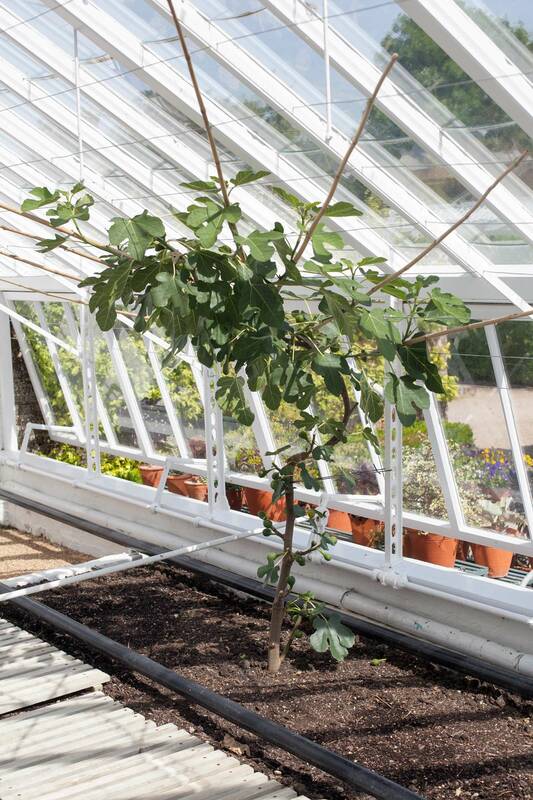 The new fig tree in the recently renovated glasshouse. Another reason is that some varieties just don’t age. 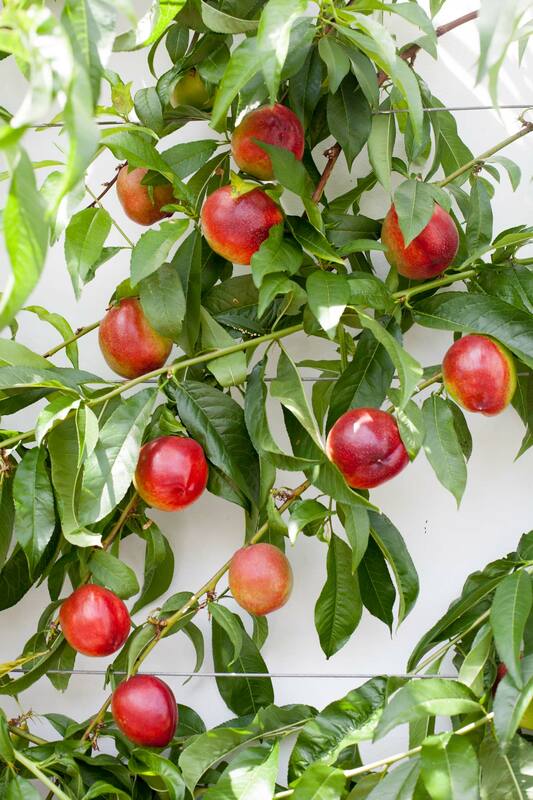 Nectarine and peach trees are very vigorous but they usually start to decline around fifteen, Claude told me last summer9. 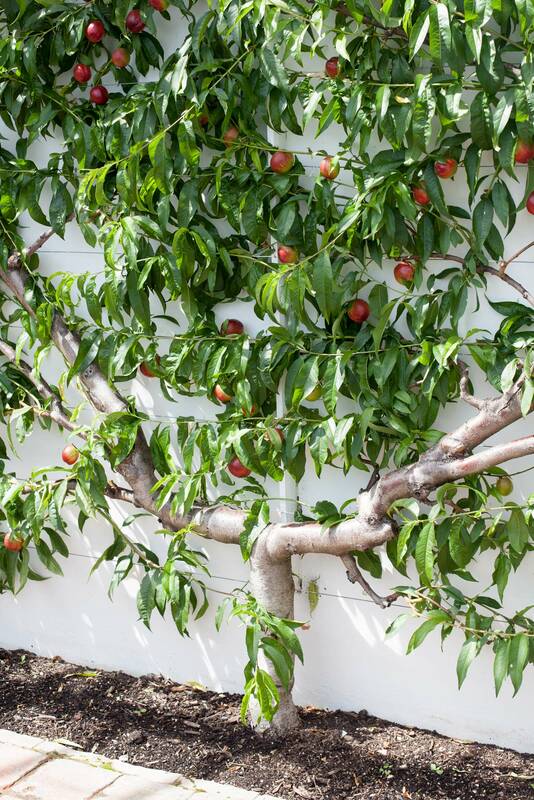 This nectarine tree is probably less than ten years old. The fruit trees at West Dean are not very old. However many of them have entered their prime age. They are both mature and here to last, which makes the place timeless. 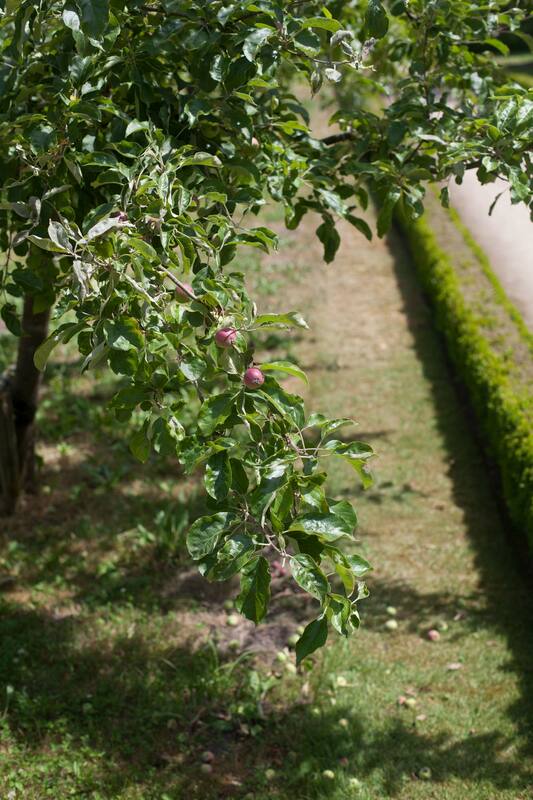 The combination of half-standard and trained trees contributes to making the walled garden a lively orchard in its prime. In other heritage orchards, older trees can sometimes be found. For instance, there are a few remaining centenary pear trees in Le Potager du Roi, the king’s kitchen garden in Versailles, France10. West Dean does not have any because the walled garden was in an advanced stage of dereliction in the early nineties. 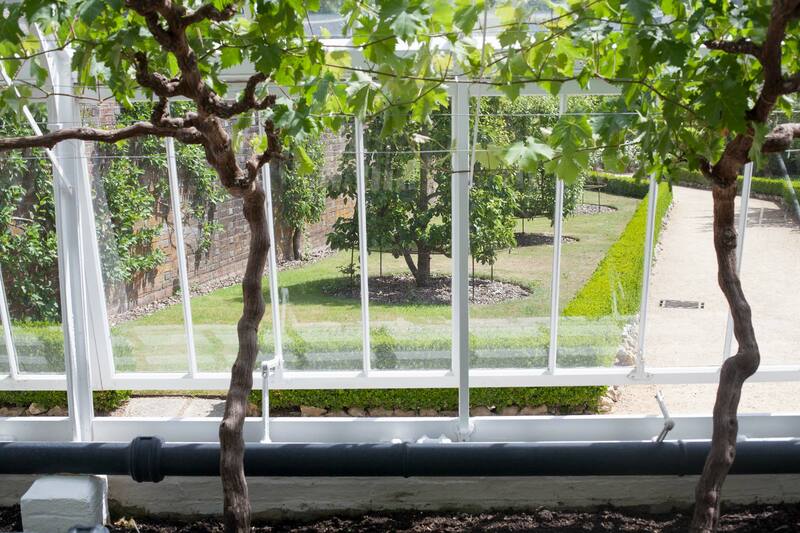 Apart from the two fig trees mentioned above and ‘two gnarled glasshouse grapes’, the gardeners had to recreate the orchard from scratch (2018: 246). 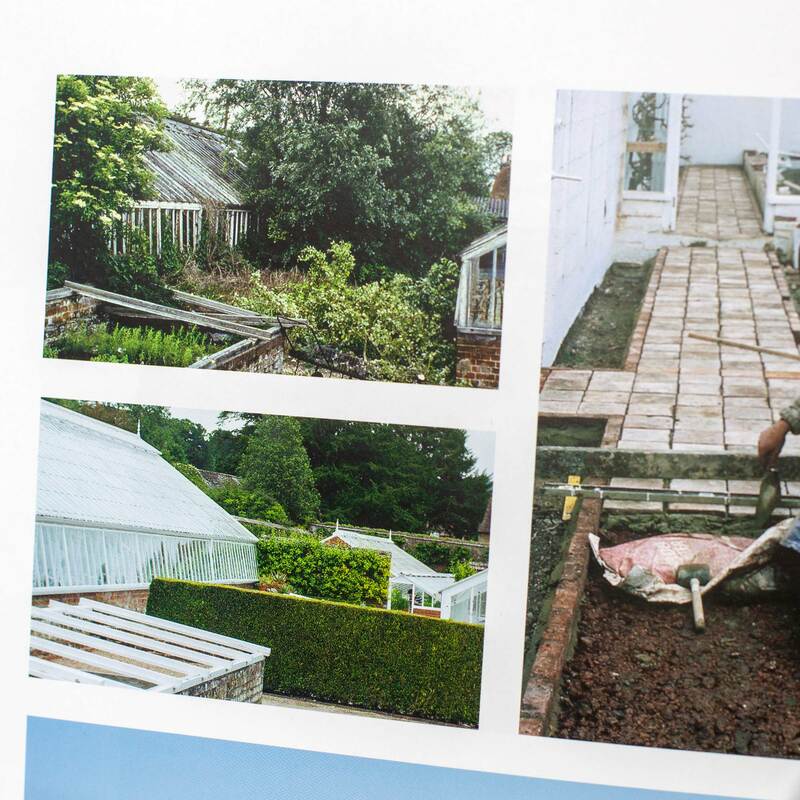 The top left picture gives an idea of how derelict the walled garden was in 1990 (2018: 150). Photo 31 March 2019. … and outdoors. Photos 23 June 2018. Jim Buckland and Sarah Wain have just retired, after twenty-seven years of service as head gardeners at West Dean. They leave the walled garden in perfect condition. Beyond the history of the place and its fruit trees, it may be the consistency of their commitment that makes visitors feel so much like being in a timeless place: we can see that it has properly been taken care of for many years, with great passion, knowledge and craft, to the benefit of everyone who likes the art of gardening. As for the fruit trees, they are healthy and productive. Isn’t that the most obvious evidence of the gardeners and the Edward James Foundation’s efficacy? This for sure is going to last. 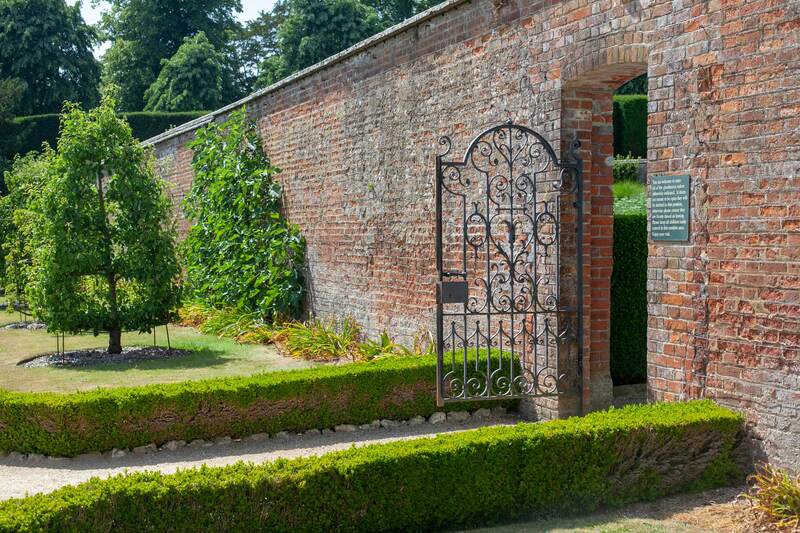 There could be a few older trees in the walled garden, which would make it even more of a timeless place. Buckland & Wain don’t talk about this in their book, but they might have planned for it. They might have planted trees aimed at lasting for a very long time, using fruit varieties, rootstocks and growing techniques specifically selected to that end. 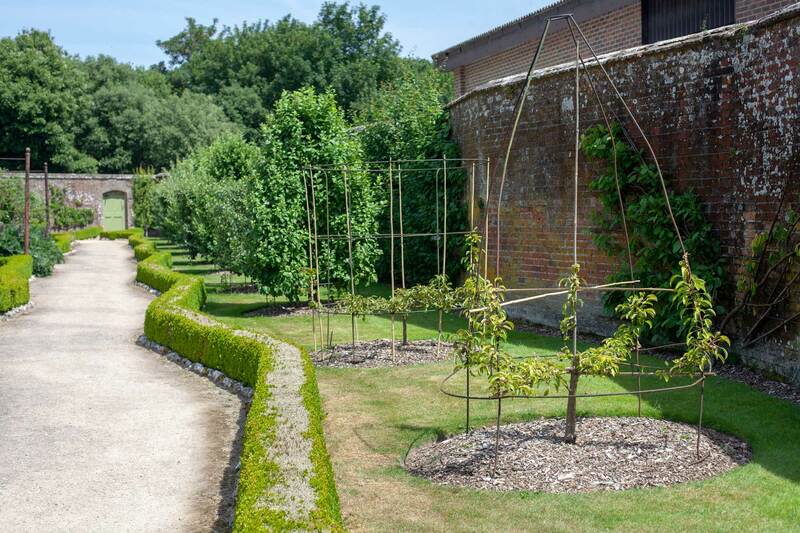 For instance, in fifty years time, West Dean’s visitors might see some eighty-years old espaliered pear trees at the peak of their life against the walls of the Victorian garden. 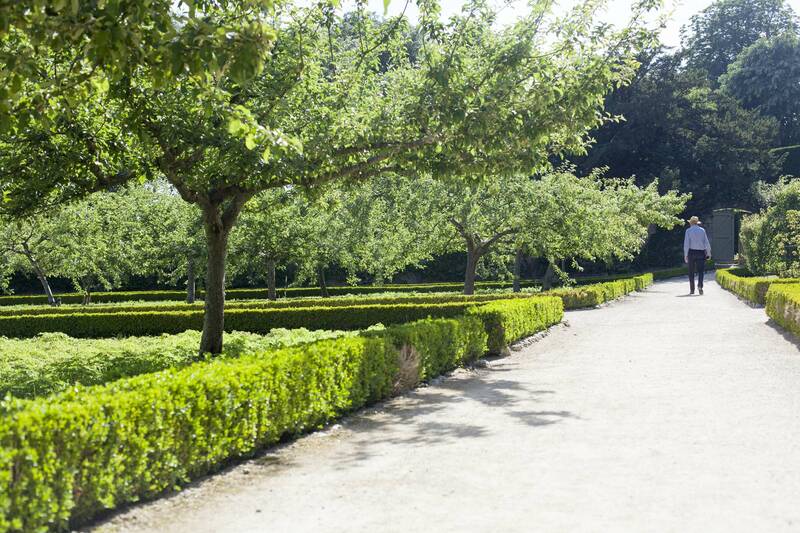 This would add to the diversity of trees and make the walled garden even more of a place worth visiting. Buckland & Wain, 2018, At West Dean, Frances Lincoln / White Lion Publishers. https://www.westdean.org.uk/gardens/about (accessed 31 March 2019). ‘In 1804, when the current house was built, the gardens were enlarged and park was laid out, and the kitchen garden was moved to its present position and enclosed by walls.’ https://www.westdean.org.uk/gardens/about/history (accessed 31 March 2019). http://westdean.assets.d3r.com/pdfs/original/28991-west-dean-gardens-map-2018.pdf (accessed 31 March 2019). https://www.dictionary.com/browse/timeless (accessed 31 March 2019). https://www.westdean.org.uk/about/who-we-are#history (accessed 31 March 2019). A picture of Home Park’s brick wall: https://www.google.fr/maps/@51.4064352,-0.3349948,3a,75y,217.59h,90t/data=!3m6!1e1!3m4!1s7fbdEm1I7S8uX0ofC2cxjg!2e0!7i16384!8i8192 (accessed 31 March 2019). https://www.westdean.org.uk (accessed 31 March 2019). 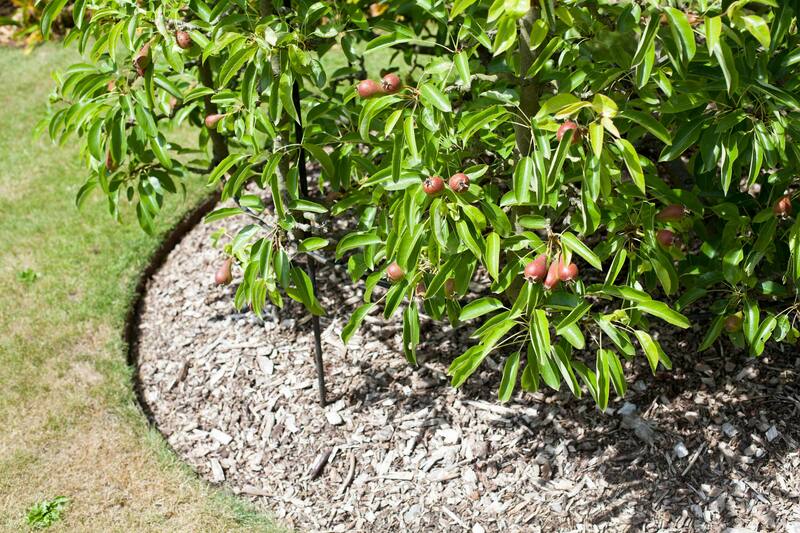 https://www.westdean.org.uk/gardens/explore/fruit-collections, https://www.westdean.org.uk/gardens/explore/fruit-collections#block–27 (accessed 31 March 2019). This entry was posted in Stories and tagged Sussex, UK by Les Jardins d'ici. Bookmark the permalink.